The Boat itself fits in the garage, but since it is the original single axle trailer with the boat, it was pre folding tongue days and that is my problem. If i had a swing tongue, the boat and trailer would fit no problem but adding one isn't so easy. The a-frame of the trailer comes together in front of the winch and vertical support post. Therefore in order to have a folding tongue, i would have to cut of the side rails, re-bend them in tighter and adjust the winch/vertical support for the bow. I know its a massive undertaking for a qualified trailer shop but after pricing out a new single axle foldable tongue trailer from Eagle, I'm looking in the neighborhood of 3800 bucks. Any suggestions? Anyone looking to unload a 21ft single axle trailer that I could buy? Lastly if I do have to buy a new one, is there any market for used trailers? 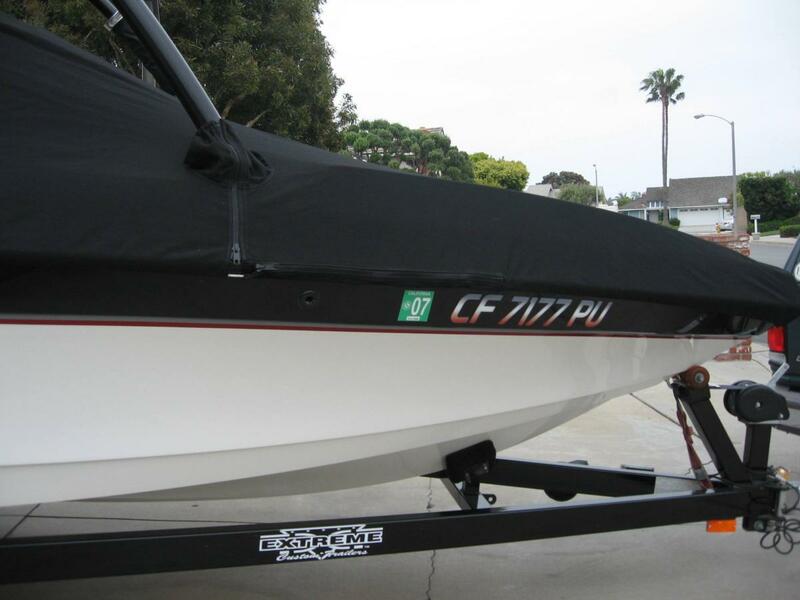 I searched on ski-it-again to get an idea but there are few on there and am not super keen on the idea of having a nautique/mastercraft trailer under a malibu boat Basically I need the fold away tongue to occur right under the winch... is that possible? 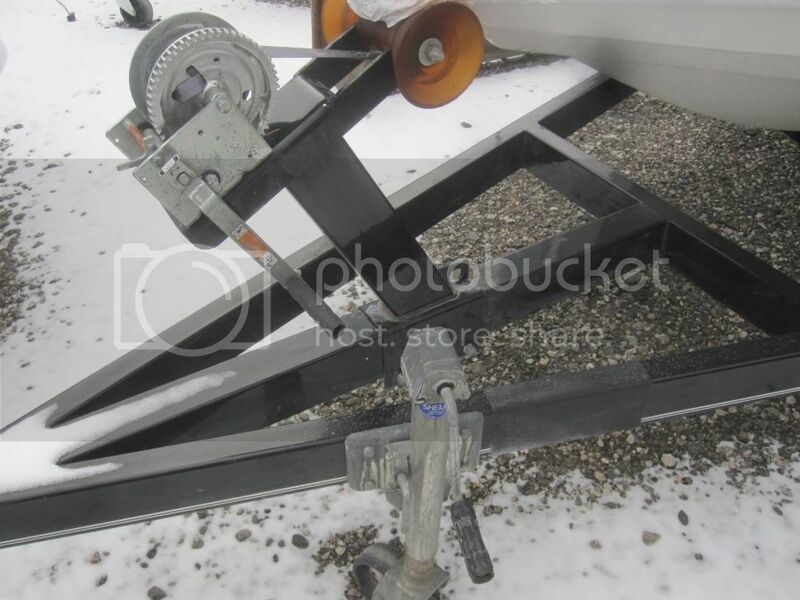 Contact Boatmate and have them quote you a new single axle trailer. It might not be much more than the cost to modify your existing trailer, especially if you can sell your old one. Yeah call boatmate. The invoice for my new A20 says the trailer was $3800.00 for a dual axle. Single has to be cheaper. Tommy's in MI has one for sale. http://gettommys.com/?facetious_post_type=tommys_boat&condition=&state=&make_model=boatmate. I have no idea what the cost without a boat on it is. My old sportster had an Elite trailer. It was garbage. How about this for $1000. I'm sure you checked this, but it's worth asking. is there anything you can do on the other end of the boat to fit...remove swim step etc. If not, get with Boatmate - cheaper to start form scratch than to start cutting. His VDrive will need the axle back further for proper weight distribution me thinks. Thanks for the info so far guys! the "anything can be done" option seems a little out there and the fear of someone else seeing that if i sell it down the road could be a tough sell. Any other used trailers out there. The Kansas trailer seems like it could be an option. To determine where the proper weight is, couldn't i just measure my distance from rear end to the the axle and see where his is? As for removing the swim platform etc, that has all been done and the boat itself fits by an inch or so.... its the trailer that is causing me the problem. That one from Kansas looks wrecked to me. The guide posts look all twisted and the fender doesn't line up the the tire at all. Looks like it needs a bunch of work. Basically I need the fold away tongue to occur right under the winch... is that possible? Trailers for VDrives are built with the axle further back than direct drives. Maybe you could adjust it enough to get the vdrive far enough up to get proper tongue weight, but I doubt it. Better to find a proper trailer. I browse from time to time and due to the popularity of VDrives see more trailers for them than DDrives. You'll find something if you look for a bit. It isn't exactly how I would do it, I would have cut it in front of the winch and then welded cross members across on both sides of the cut. I could do it in under 8 hours - so a competent welder wouldn't have any issue with it. Check out http://www.phoenixtrail.com/ for brand new trailer. Anyone looking to unload a 21ft single axle trailer that I could buy? Why do you want another single axle? A single axle with your boat is really pushing the limits. 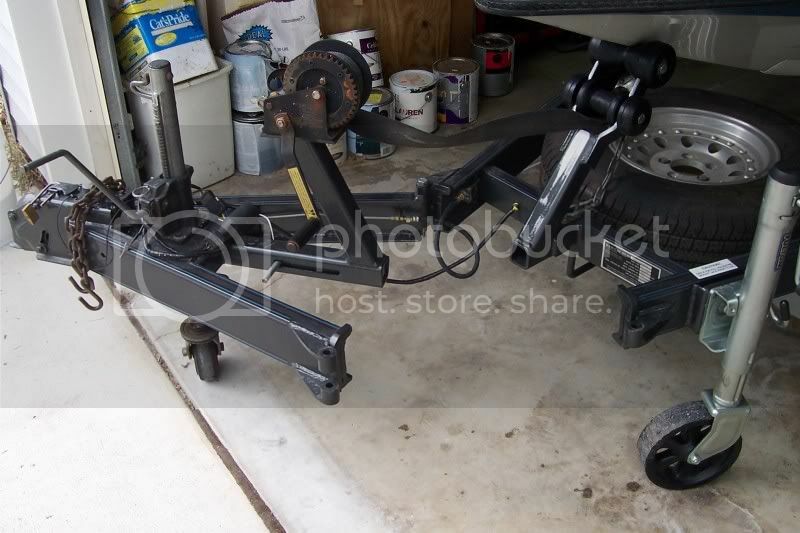 A typical 5-lug boat trailer axle is rated @ 3500 lbs. Your trailer is probably 800-900lbs on its own. Malibu's lists their boats ratings for a lot less than what they actually weigh. Even if you followed the 2900lbs Malibu lists + 800lbs for a trailer, you are already at 3700lbs. Obviously there is a bit of tongue weight, so let's say 300lbs off the load on the axle. You are now @ 3400lbs. A full tank of fuel is another 200lbs. Don't forget the weight of the tower and other extras on the boat, water in the block + engine oil, residual water in the hull, stereo extras and your regular gear, you are probably at least 4000lb load on the axle (being conservative). That means an overloaded axle PLUS needing tires rated at 2000lbs+ each. Obviously folks get away with it all the time. I just know I wouldn't want to rock a single axle for any amount of towing on one of these boats. Every single axle trailer I've seen under a modern Malibu is 6 lug. If towing any real distance, I agree. However, if it is only a short run to the ramp or is just used to store the boat in the off season (boat kept on lift) than a single axle is fine. Some people prefer it also for the ease of moving the boat/trailer around by hand in a tight garage. His is a 5-lug. At least the spare tire on the trailer is 5 lug. my trailer is a 6 lug trailer.... almost all singles i believe are. I just purchased new load D tires and rims for the trip home from Michigan. I understand the wants/needs behind a tandem axle trailer but given the situation I'm in, I almost have to have a single because the trailer is doing many tight tight turns in the driveway along with hand maneuvering in the garage just to get it to clear by an inch. I know not ideal but some thing i have to live with. I will be doing several trips with the boat and yes a single axle is more dangerous but i will have to watch tires bearing etc and keep up on service. Ahh, just noticed that. Makes more sense. It says it's from a Mastercraft 205V.....may/may not work for you, but thought I would throw it out there. The 205V has a 3" narrower beam than the SV23 and 5" shorter (this is why the 205V/X-star's are so much smaller than the Malibu's of the same era). The SV23 is likely too big for that trailer. Length may work but 3", though it doesn't seem like much, could be the difference between clearing the fenders or not. thanks for the specs nitrous! kept me from pursuing it further.